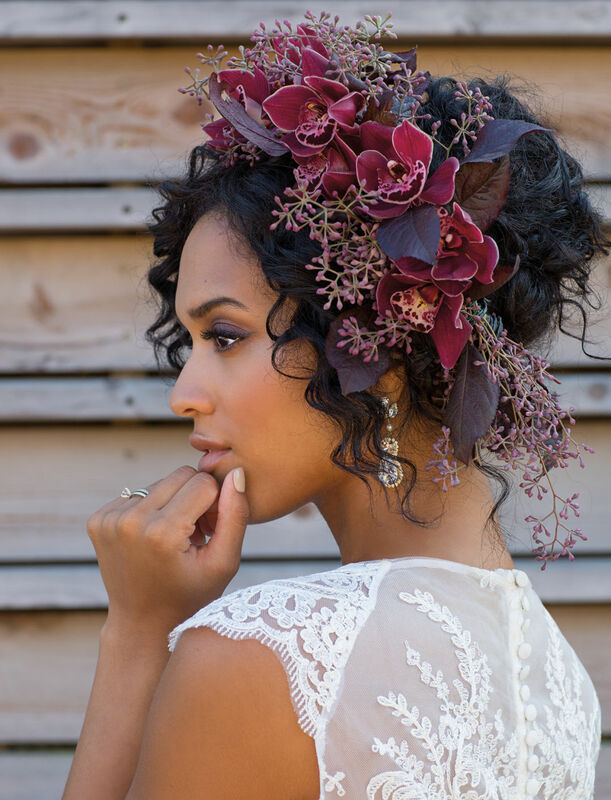 Nisha Klein of Fleurish created this black rose and orchid-filled bouquet ($300) and headpiece ($85) “for the unconventional bride whose personal style is confident, expressive, unapologetic, and at times mysterious.” Elements in both include Black Baccara rose, lisianthus, cymbidium orchid, sweet potato vine, seeded eucalyptus, scabiosa, smokebush, carnation, echinacea, Queen Anne’s lace, ornamental grass, cherry leaf, and ranunculus. Pennington lace paneled crêpe maxi skirt ($3,090) and Caplan cropped lace and crêpe top ($1,290) by Rime Arodaky, The Dress Theory. Carolina Bucci gold ribbon bracelet ($3,000), TWIST. Helena Noelle Couture Swarovski crystal drop earrings ($105). Rings, stylist’s own. 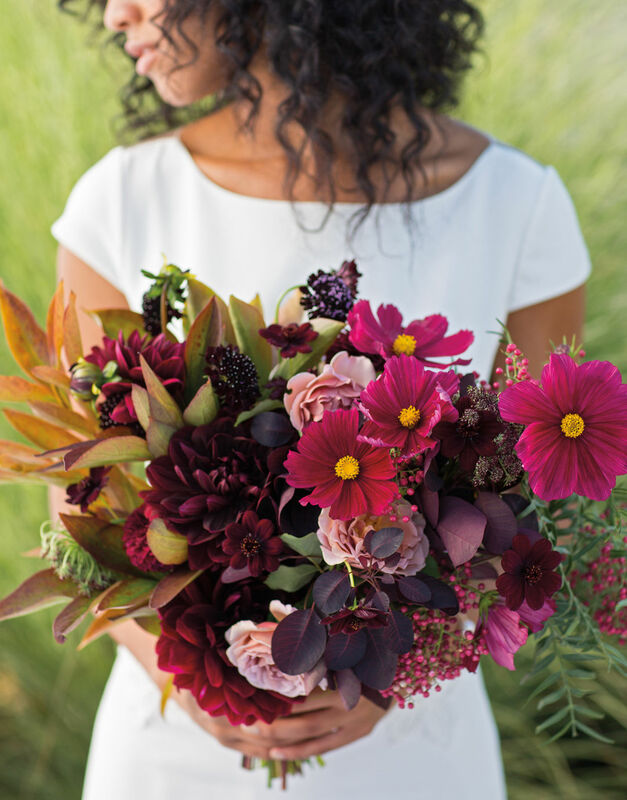 foliage, and chocolate cosmos to create a natural, cascading bouquet ($225) and a stunning centerpiece ($150) in a matte silver bowl. 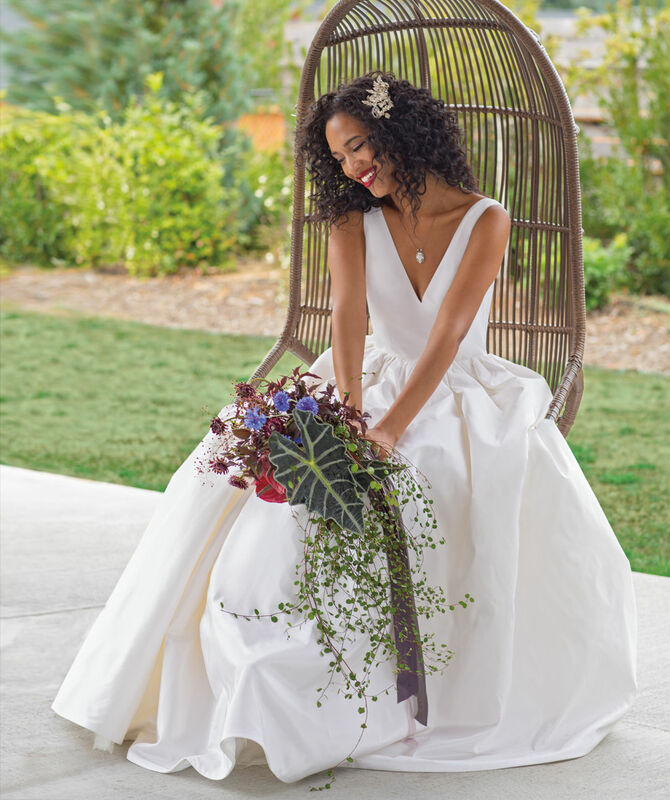 White satin Drusila gown with floral cut-out cap sleeves and a bateau neckline ($3,290) by Pronovias Modelo, La Belle Salon. Casey earrings ($52.50), Mea Marie Bridal. Hilly bangle ($129), Swarovski. Lo-Kata Louise et Cie shoes ($99.95), Nordstrom. 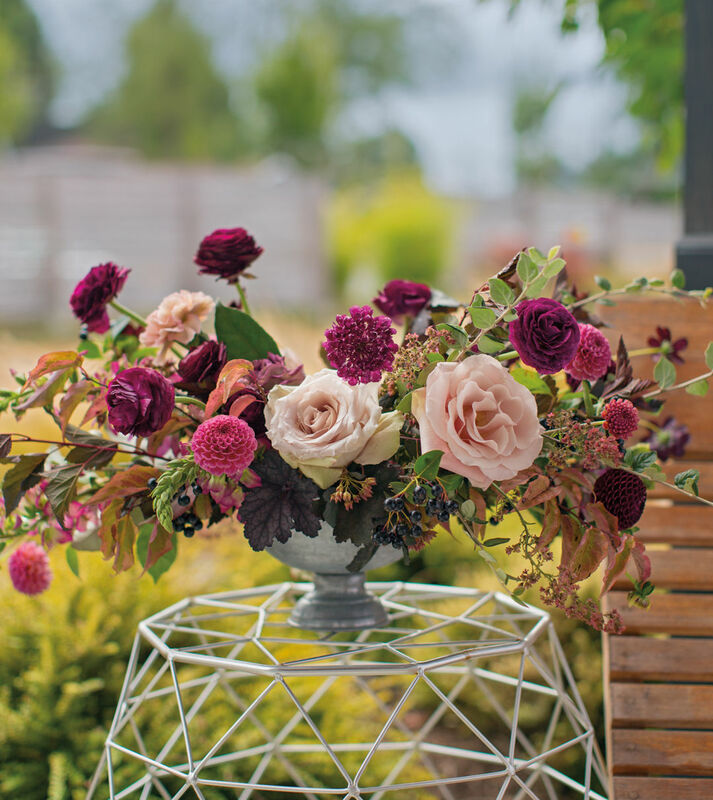 “This style of bouquet would be perfect for the adventurous, eclectic bride who appreciates sourcing locally grown products as well as stepping outside of the norm,” says Carlee Donnelly of Rusted Vase Floral Co. She sourced everything in her bouquet ($250) and cuff ($50) from the greater Puget Sound region and used minimal greens among the peony foliage, Koko Loko roses, chocolate cosmos, raspberry scabiosa, pepper berry, smokebush, dahlias, and chocolate lace. Devin fitted crêpe and floral embroidery Rime Arodaky gown ($3,690), The Dress Theory. Moonstone Chandelier earrings ($1,760) and Mizuki pearl bracelet ($764), TWIST. “The bouquet’s sultry, dark colors offset the modernity of the materials, which were chosen in an exploration of finding femininity in sharp, structural flora. I savored the process,” says Stephanie Downes of Vanita. 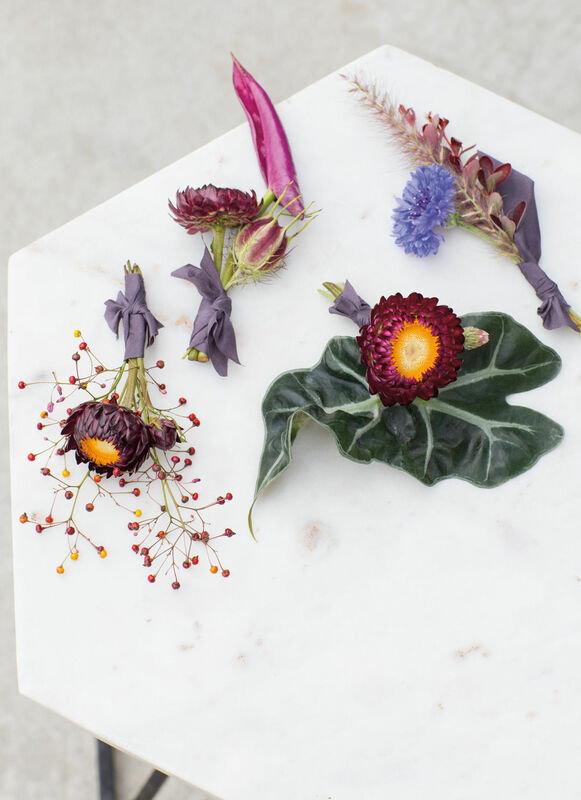 Elements of her bouquet and boutonnieres (price upon request) are anthurium, wire vine, African mask, strawflower, bachelor buttons, chocolate eupatorium, nigella pods, barberry, fountain grass, and jewels of Opar. 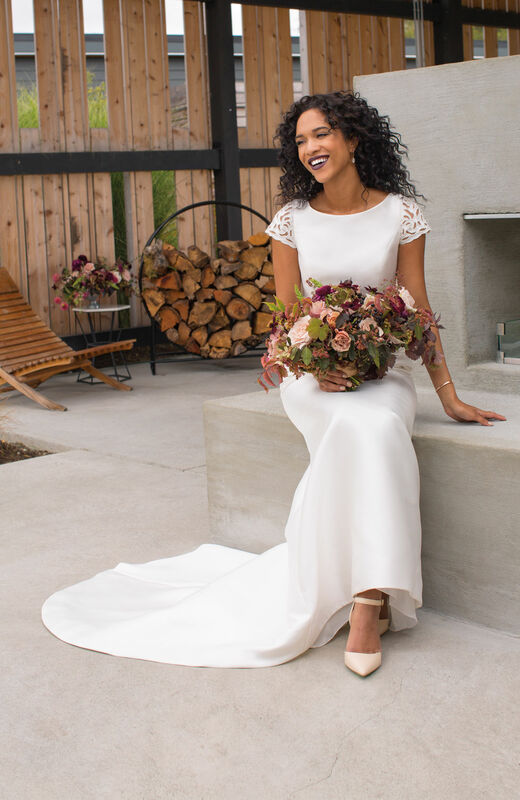 The Ramsey silk Shantung ball gown ($3,200) by Tulle New York, and Heidi Hull necklace ($200), both Mea Marie Bridal. Crystal headpiece ($136), LaBelle Salon. Little Fireworks earrings ($69), Swarovski. 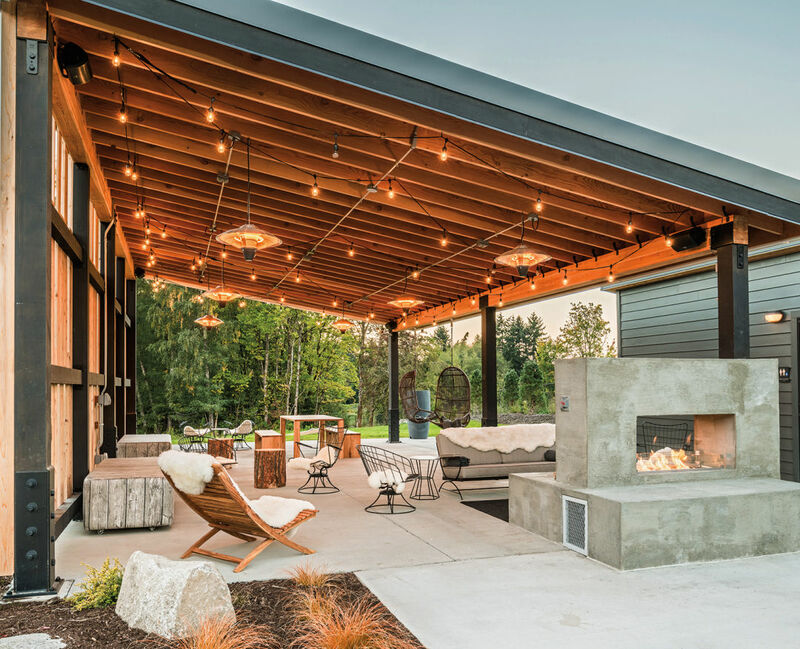 The Lodges on Vashon feature a design that marries “the best of minimalism and eclecticism.” Rent the Pavilion ($750/day), Public House ($500/day), or the entire space, complete with adorable cottages for your wedding or event. If the entire space is rented, Pavilion and Public House are included. Call 206-693-3750, or go to lodgesonvashon.com for more information.